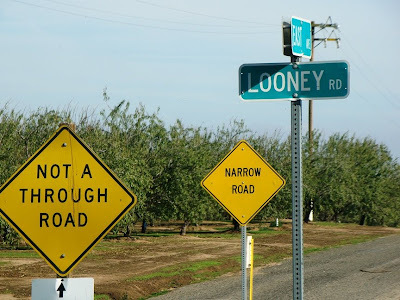 It didn't take long for Ron Schott and Silver Fox to figure out my little quiz yesterday about some odd similarities and disparities in California geography. 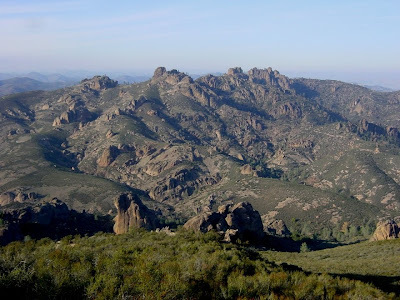 The question had to do with an "a is to b as c is to d" equivalence concerning the Pinnacles and Neenach volcanics, and San Luis and Castaic reservoirs. The short answer is: they are on opposite sides of the San Andreas fault, they are separated by 200 miles or so, but they are exactly the same. The volcanics are the same volcano, and the reservoirs hold water from the same river system. 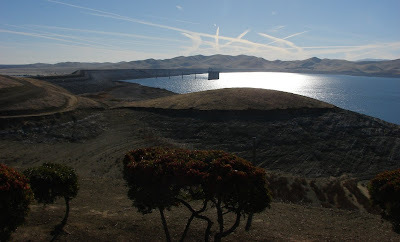 The difference is the magnitude of timing: it took the San Andreas fault more than 20 million years to shift the sundered volcano 195 miles apart, but we have made an artificial river that carries water 200 miles south in a matter of days or weeks. The California Water Project is an engineering marvel (or monster, depending on your political and environmental leanings). The state is truly bipolar, in political leanings (kind of a coast versus inland bifurcation), population (mostly in the south), and in water availability (mostly in the north). The problem is that all the people down south need water, lots of it, and the local mountains only capture about 15% of what they need. In 1960 California voters passed a massive (for its day) bond issue of $1.5 billion to construct a system of aqueducts, canals and reservoirs to transfer entire rivers to the southland. The peak pumping discharge exceeds 13,000 cubic feet per second, which to me is pretty incredible given that our local river, the Tuolumne, is considered to be in flood stage at just 9,000 cfs. It mostly provides water for agriculture in the south San Joaquin Valley where the land had been sinking for decades from overdrafting the groundwater. 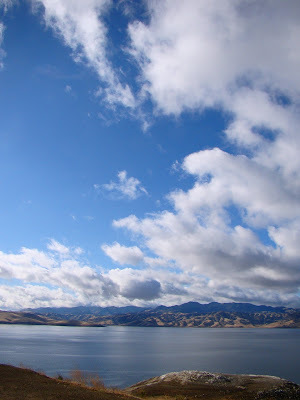 The remainder is pumped over the Tehachapi Mountains to provide water for 20 million plus people. 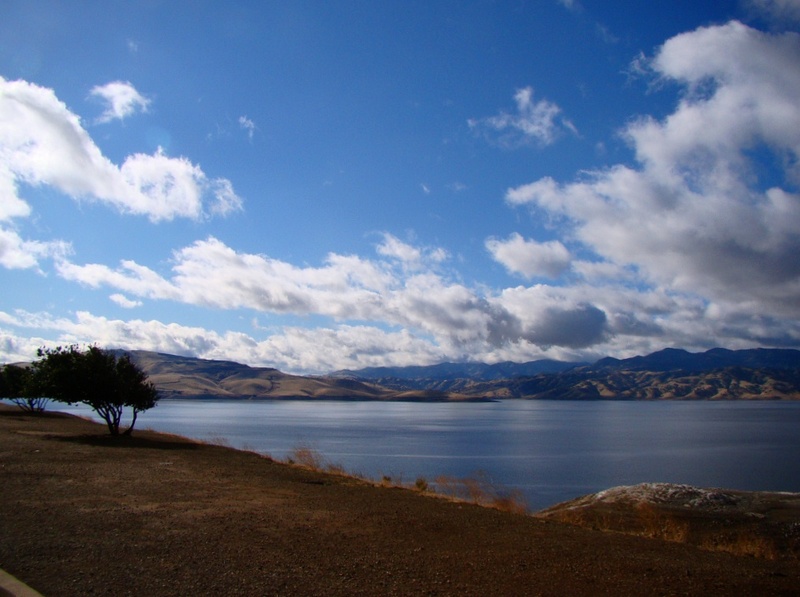 San Luis Reservoir is the largest offstream reservoir in the country with a storage capacity of more than 2 million acre-feet. 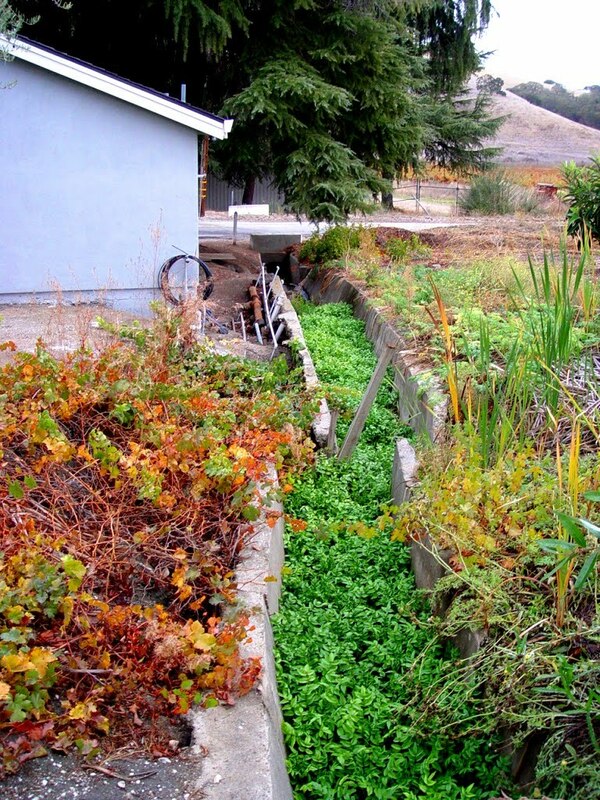 'Offstream' refers to the fact that the watershed it blocks provides little or no water. All of it is provided by the aqueduct. The California State Water Project has caused problems. Decreased water flow into the Sacramento Delta and San Francisco Bay have caused serious environmental problems, and have affected salmon runs as well as impacting other fish and bird populations. 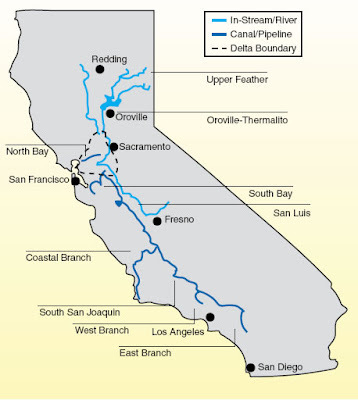 It also has a gaping vulnerability: a moderate earthquake could destroy levees in the Sacramento Delta, and inundate the Tracy pumping station with salt water for months or years depending on how soon winter runoff could flush out the water (check my previous post on this here). Our state is bipolar. After fossil fuels, water is one of the most contentious of political issues that we face now and in the future. It would help if people stopped a moment sometimes while spraying off the driveway and watering their tropical rainforest plants they use for landscaping to consider how much effort was made to get that water. When you are stuck on a 400 mile long highway on a holiday weekend, the mind wanders in strange places. As I drove along, I made kind of an odd connection between a few places I visited in the last week. Can you? 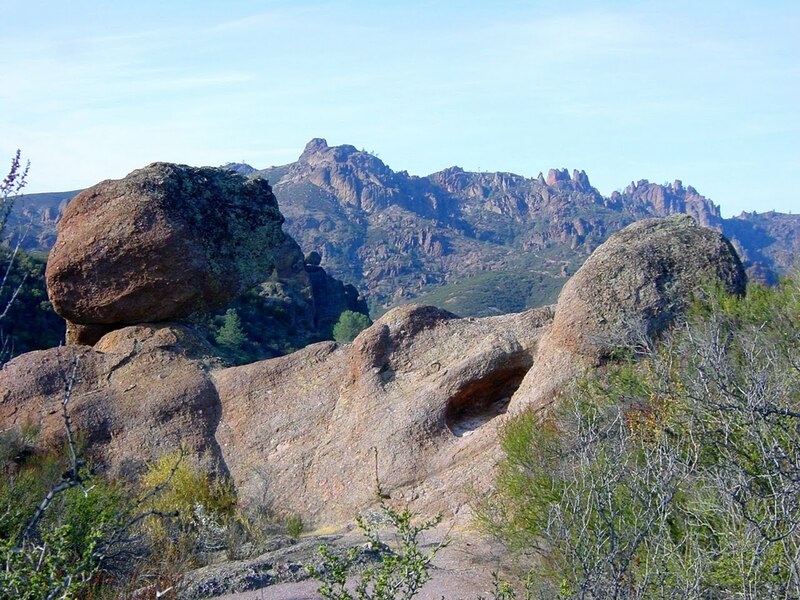 The picture above is at Pinnacles National Monument in the central Coast Ranges. The place in the picture below is part of the Neenach Volcanics in the Transverse Ranges of California between Palmdale and Gorman. The lake in the picture below is San Luis Reservoir near Santa Nella. 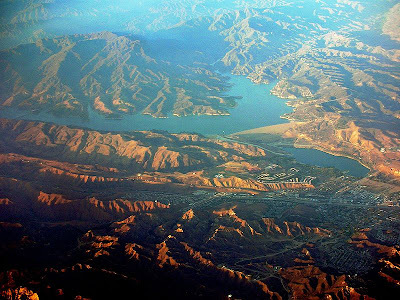 The lake in the picture below is Castaic Lake in Southern California (picture from the commons at Wikipedia). 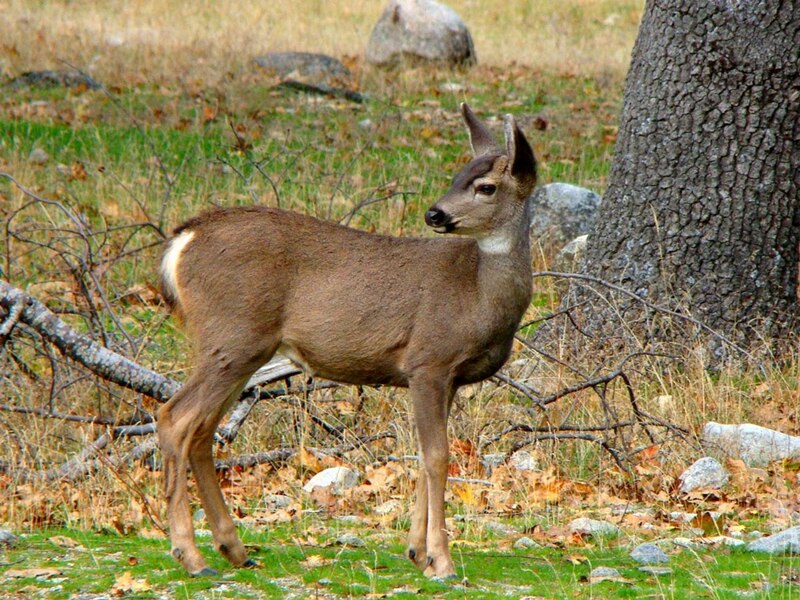 It fills a canyon region in the western San Gabriel Mountains near I-5 above the Santa Clarita Valley. OK, so here is my observation: Picture #1 is to picture #2 as picture #3 is to picture #4, but on a different scale of magnitude (magnitude of what? Not stated here!). Any ideas? A thousand real estate agents abandoned the shopping malls, grabbed their cameras, and snapped pictures today in southern California. Why? Because it was a gorgeous clear day like no other...and that's the problem. If you sell property in SoCal, your pictures of houses for sale have big beautiful mountains in the background. Mountains that are commonly invisible when you actually live there. Given the all-too-common state of the air in the basin, this could be called false advertising. In the first years of my youth, I lived in the Inland Empire, the citrus-growing region around Riverside, Upland and San Bernardino. There were smog problems back then, but most people accepted that as a fact of life, the cost of living in big cities. The ring of mountains surrounding our valley guaranteed that the poisoned air could not escape and be dispersed across the desert. In those days of the 1960's, no one could conceive that anything could be done about air pollution, much less that it should be. I grew up next to a steel refinery which, their media officials proudly pronounced, produced only 15% of all the smog in southern California. But dammit, they employed thousands, and even offered medical benefits (ever wonder where Kaiser Permanante came from?). Air pollution was the symbol of a booming economy, even if it was sickening and killing the people who had to live in it. I have memories of the vast wall of yellow gunk streaming over the Chino Hills most afternoons, and after a time a smog alert would be issued and p.e. class would be canceled that day. It would physically hurt to take a deep breath. That was just the way things were, and there wasn't anything that could be done about it. There is still plenty of pollution, but for the actions we chose to take the Los Angeles basin and the Inland Empire would have ended up looking like the L.A. of the movie "Blade Runner". The Clean Air Act made a difference. Even though the population has perhaps quadrupled since I lived there, pollution systems in cars and factories have improved air quality to a huge degree. It would never have happened without government intervention, and we are all the better for it. I think of the Clean Air Act and other landmark legislation that made life better for all of our population, not just a chosen few. Politics has always been about getting the advantage for those stand to make the most money, but once in a while we can force politicians to rise above their base instincts and really do something for the good of the country. The ranges in these pictures are the mountains of my youth. 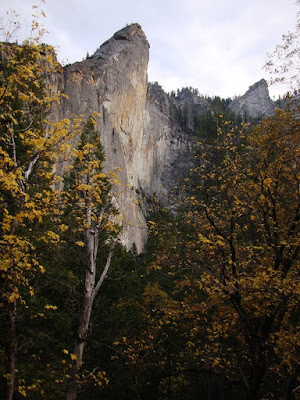 I have stood on many of these summits, and explored many of the canyons hidden in the folds of the jagged rock. 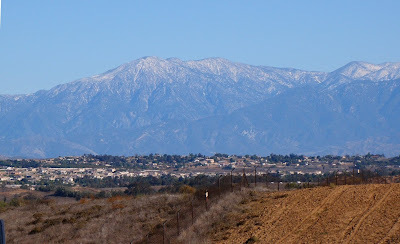 The first picture shows the rugged eastern end of the San Gabriel Mountains, the high ridges of Cucamonga Peak, Ontario Peak and Mt. San Antonio, ranging from 8,000 to 10,000 feet in elevation. They are composed of plutonic and metamorphic rocks ranging in age from Proterozoic to Mesozoic time. The mountains have risen rapidly in the last few million years, and have been described to me as statistically the steepest mountains on the planet. Indeed, the only places flat enough for developments in these mountains are on landslide deposits (Baldy Village and Crystal Lake, for instance). The town of Wrightwood, besides being sited on top of the San Andreas fault is also occasionally damaged by mudflows from the unstable slopes above. 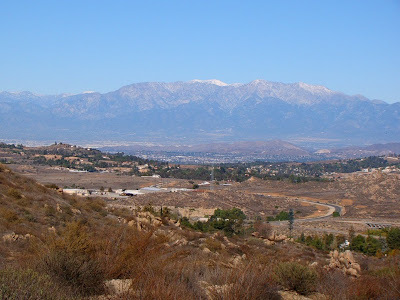 The high ridges in the second picture are in the San Bernardino Mountains, the highest mountains in southern California. They are also composed of plutonic rocks, but also include Paleozoic metasedimentary rocks with affinities to those in the Mojave Desert. They are quite unlike the adjacent San Gabriel Mountains, which is hardly a surprise given that the San Andreas fault passes between them. The rocks of the San Gabriels originated far to the south, and have been carried north by lateral motion along the fault. The high ridges of San Bernardino Peak made an ideal location for the initial survey station for the township and range system of property boundaries across southern California. The primary east-west survey line is called a "baseline", and if you stand in the middle of Baseline Avenue as it runs through Claremont and Upland, you will see that it lines up exactly with San Bernardino Peak in the distance (you need a clear day, and watch out for traffic!). I am trying trying to build a photographic record of some of the places I grew up in as part of my "Other California" series, so look for a few entries as I revisit the mountains of my youth. In the meantime, I recommend a wonderful book published by Stephens Press called "Call of the Mountains" by Ann and Farley Olander. 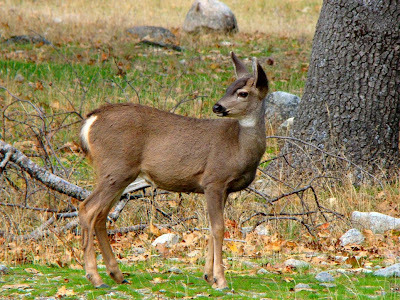 It's a wonderful photo essay of the San Gabriels, the San Bernardinos, and the San Jacinto Mountains, the not-quite-fully appreciated jewels of the mountains of Southern California. I didn't think it would take long for the geologists among us to figure out that we looking at a fault rupture in yesterday's "minor mystery photo", and I wasn't disappointed. These en echelon cracks are called riedel shears, and are the first cracks that appear as a solid material is being put under (in this case) lateral stress. 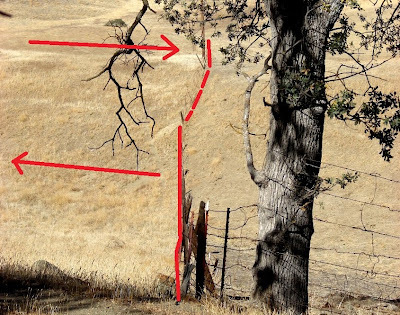 There was no earthquake; this is a section of the fault that is creeping, meaning that it is moving constantly without building up enough stress to produce large earthquakes. 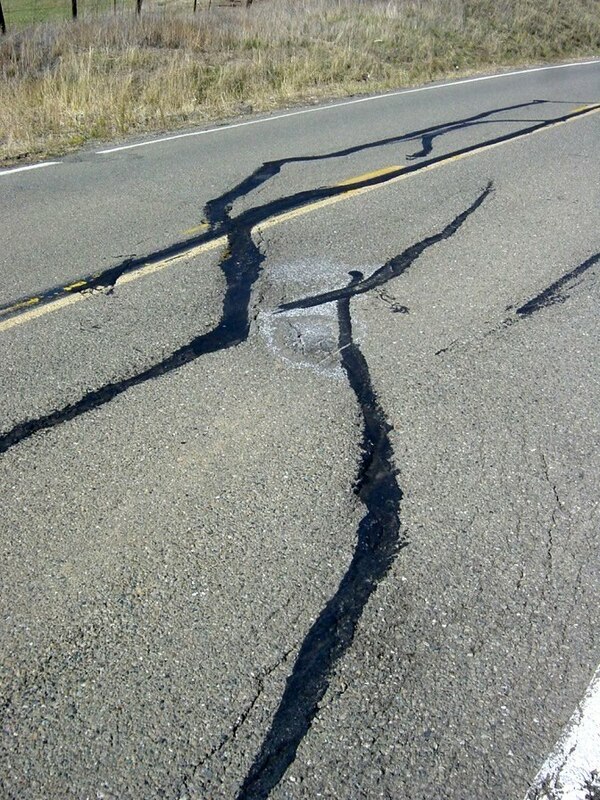 This isn't just any fault; it is the fault in California, the San Andreas, which forms part of the boundary between the Pacific and North American plates. 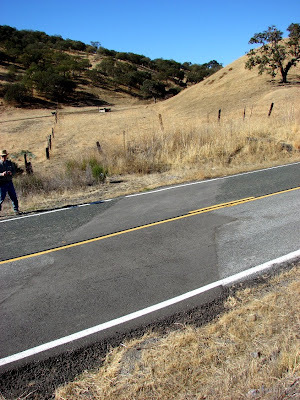 The section we visited on Saturday is between the town of Hollister and Pinnacles National Monument, south of the 200 mile long rupture from the 1906 quake in San Francisco. How much does the fault move every year? Without human developments, the year-to-year movement would be hard to see because the subtle effects are obscured by weathering and erosion. In the pictures below (about 8 miles south of our damaged highway) the old fencing shows several feet of offset. Probably the most famous evidence of movement on the creeping segment of the San Andreas is the De Rosa Winery warehouse (formerly the Almaden Winery). The winery was first constructed in the 1800's and has been rebuilt twice after the building foundations failed. 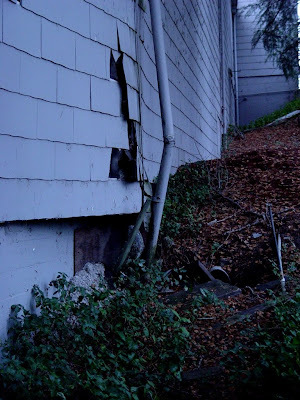 The current building is also being ripped apart, along with a culvert that has been photographed many times by visiting geologists (thrilled, no doubt, by the fact that they can combine their field research with wine-tasting!). The winery owners study geologists too; in this article, they are quoted as saying "Their pants always have zippered pockets...The khaki pants and the funny hat, and you know it's a geologist." I am traveling this Thanksgiving, like so many others, and will have infrequent web access (my phone is only semi-smart and only makes phone calls). I hope you all have a fine holiday, and that you have many things to be thankful for. Below is one dinosaur descendant that is feeling thankful that it won't be eaten this holiday, as it lives in Pinnacles National Monument and enjoys protected status. 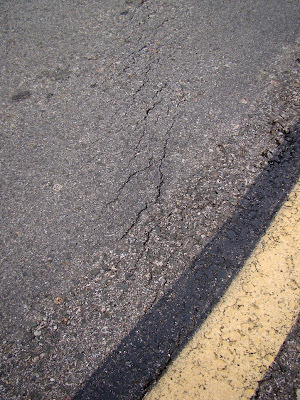 So what has caused the road damage? It was seen on our road trip last Saturday that also included my musings about the journey of a normal looking rock. A clue might include the fact that I convinced a bunch of otherwise mature and responsible college students to act silly in the middle of an occasionally busy highway (note the road repairs). I have spent a lot of time writing about the "Other California", the places in my state that don't always appear on the postcards. 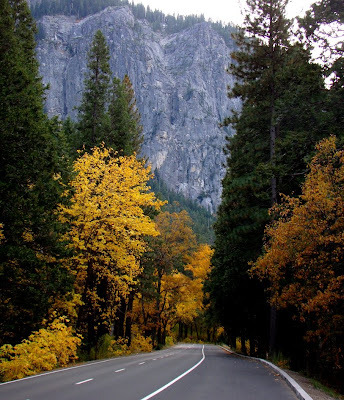 I am always hoping to make folks aware of the riches our state has to offer when one gets off the beaten path, but I find that sometimes I like to go where everyone else goes, because, let's face it, California is a spectacular place. 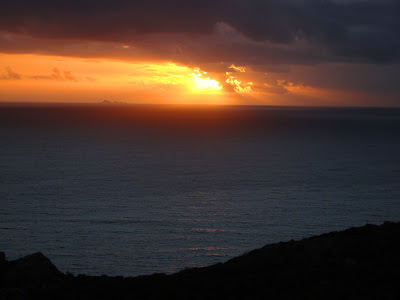 Today was one of those times, as I found myself on Highway 1 in the late afternoon exploring the Marin Headlands and Mt. 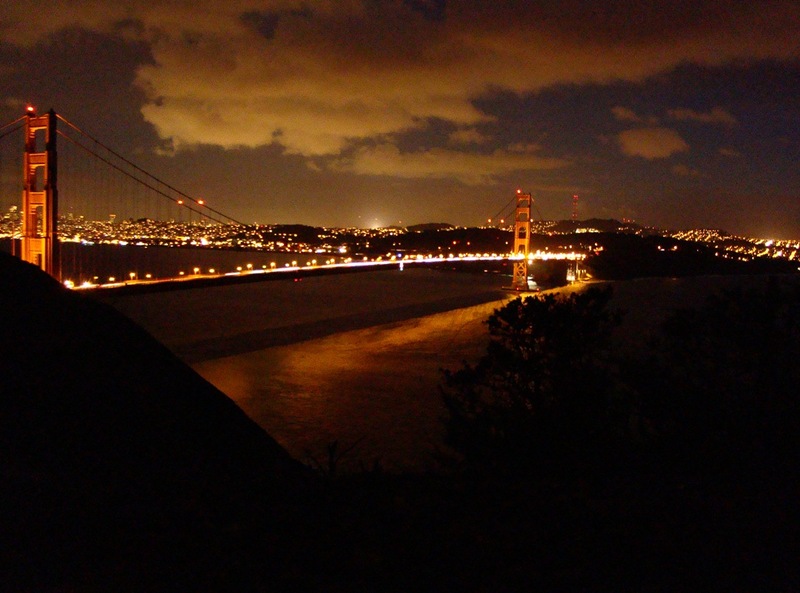 Tamalpais State Park (the Headlands are part of the Golden Gate National Recreation Area). 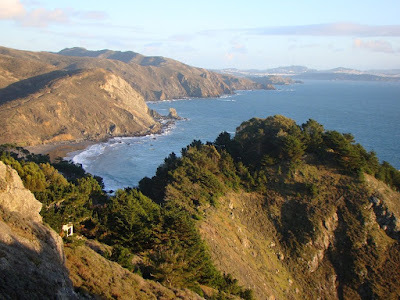 These are the rugged mountains and coast at the north end of the Golden Gate Bridge outside of San Francisco. 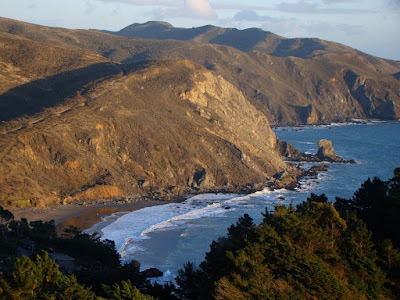 This beautiful stretch of coast is composed of the rocks of the Franciscan Complex, a chaotic mix of deep sea sands and muds, fragments of ocean crust and mantle, and even the occasional limestone reef deposit. 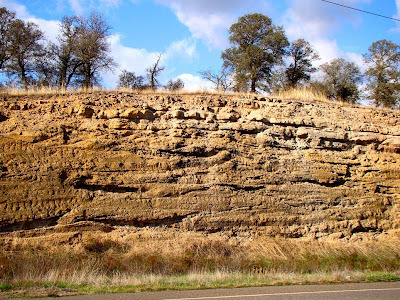 The rocks formed in the trench of a subduction zone that lay off the coast of California in the time of the dinosaurs. The subduction zone is long gone, but the geologic violence that contributed to their origin continues in the lateral movement of the San Andreas fault which passes a short distance offshore. Large earthquakes like the one that devastated San Francisco in 1906 (close to magnitude 8) can tear the fault over a distance of 200 miles, and shift the crust 10-20 feet over much of that distance. The quakes occur every 100-150 years or so (do the math...). 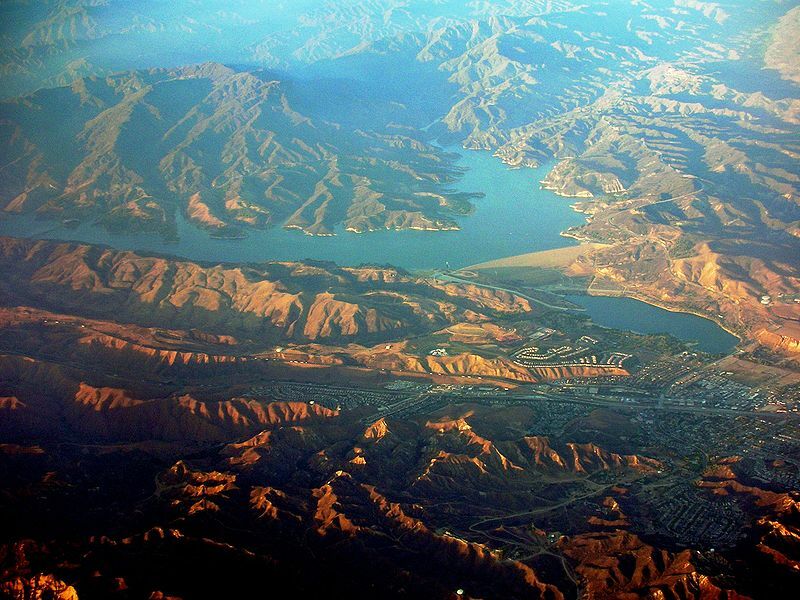 The San Andreas has been active for more than 20 million years, and in that time has transported a wide swath of California and Baja California northward some 200 miles. Part of the evidence can be seen in the gratuitous sunset picture below, as one can pick out some small islands on the horizon. These are the Farallon Islands, which are composed of granitic rock related to the Sierra Nevada batholith exposed far to the south. The small islands are an important bird rookery, and the only human inhabitants are a few biology researchers. The storm that threatened to wash out our field trip yesterday (but conveniently waited until the evening to let loose) cleaned up the sky and the gave us a beautiful sunset. 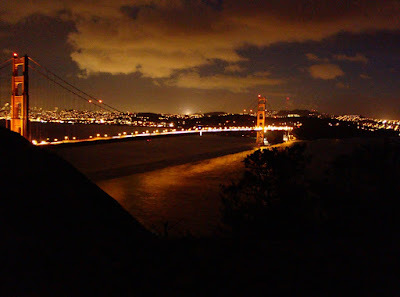 Before heading out for dinner, we stopped briefly on a ridge over the Golden Gate Bridge, and took in one of the most beautiful of all cities, San Francisco. It was a beautiful evening! Meet my new deskcrop! I was out on the last field trip of the year, a journey through the Diablo Range to the San Andreas fault and Pinnacles National Monument. We had a wonderful day, which we didn't exactly deserve or expect. It poured all night, and somehow the rain stopped at daybreak. We had a few showers during the day, but a big storm was brewing in northern California (four feet of snow expected in Lake Tahoe, for instance). Happily, the deluge didn't start until we arrived back in town, and it has been pouring ever since. In between we were treated to a beautiful display of clouds and rainbows, and we had a full day learning about California's most famous fault, and a few others as well. I picked up one rock, though, which captured my imagination, and reminded me of why I fell in love with the science of geology so long ago. It's a porphyritic andesite that I picked up on the shoreline of San Luis Reservoir near Pacheco Pass in the Diablo Range. 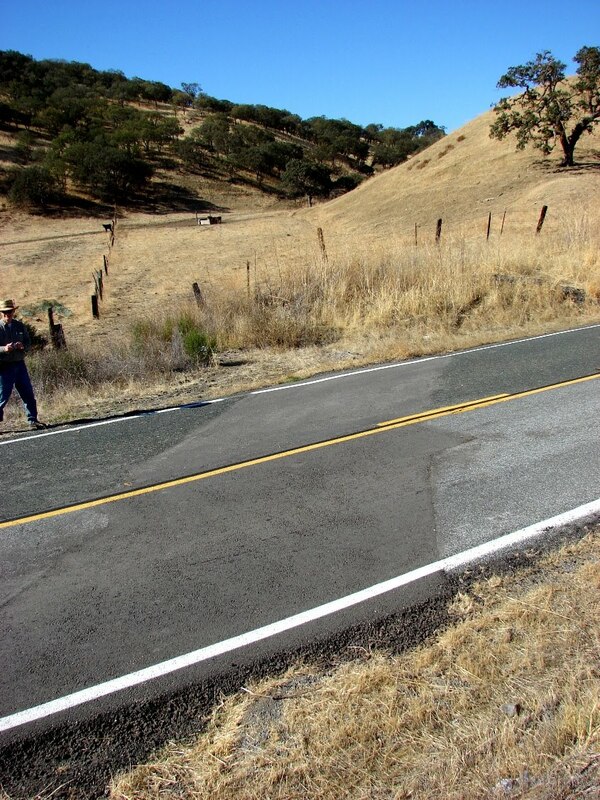 The mountains form the western boundary of the Great Valley of California for a distance of about 125 miles. It's not a remarkable rock in and of itself. Andesite is one of the most common of volcanic rocks, found pretty much all over the Pacific Rim in places like the Cascades, the Japanese islands, Indonesia, and by incredible coincidence, the Andes! 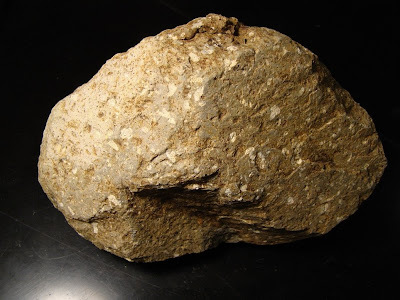 The story of this rock could be very straightforward; it could be as simple as: it erupted...the rock weathered a bit...and I picked it up. But that isn't the whole story. Context is so important; I picked the rock up from a layer, seen below, that was exposed on the eastern flank of the Coast Ranges. It is a sedimentary conglomerate. Again the story could be fairly simple; conglomerate is a fairly common rock too. We could hypothesize that the rock journeyed a bit further from the volcano, down a river and the river flowed from the mountains onto an alluvial fan. Along the way, it was rounded off by bouncing against other rocks...then I picked it up. It turns out that story doesn't quite work as a hypothesis either. This conglomerate has some odd features that tell us that it didn't form in a river. It is topped by a gray sandstone that is in turn covered by siltstone and shale. Above it is another layer of conglomerate that is covered by sandstone, siltstone and shale. This pattern is repeated over and over, until we have a sedimentary formation more than 20,000 feet thick (four miles)! The layers contain marine fossils; some are shells of snails and clams, but sometimes the rocks include shark teeth and the remains of giant marine reptiles like ichthyosaurs, plesiosaurs, and mosasaurs. OK, but what in the world could be moving boulders and cobbles around on the sea floor? Isn't that one of those places where the water is calm all the time? Sometimes that is the case, but not here. 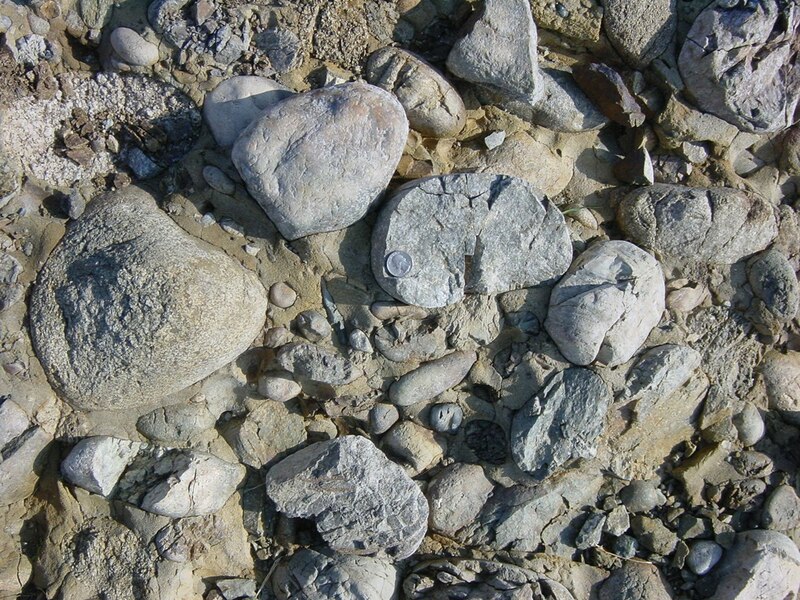 These rocks accumulated in large river deltas extending into a shallow sea that lay off the coast of California in late Cretaceous time, the final period of the dinosaurs. Because of constant large earthquakes, the edges of the river deltas were unstable and were often shaken loose. The mass of rocks turned into turbulent chaotic masses flowing along the sea floor at 30 or 40 miles per hour. These violent events are called turbidity currents. The turbidity currents can carry rocks for many miles. As the flow slows down, the larger particles settle first, followed by the finer particles, and so on. The sedimentary beds become graded by grain size (graded beds). But why earthquakes? And where did the lavas and magma come from? It turns out these things are related too. This story seems to grow more complicated by the moment! 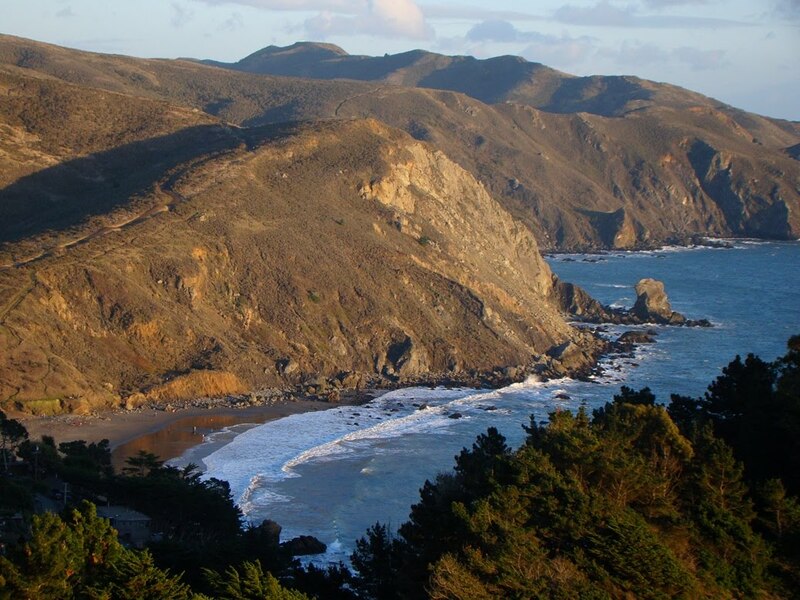 In Cretaceous time, there was no San Andreas fault, and there was a lot less of California, at least a California that could be seen from above sea level. A vast subduction zone lay offshore, a place where the Pacific Ocean crust was being pushed under the North American Continent. 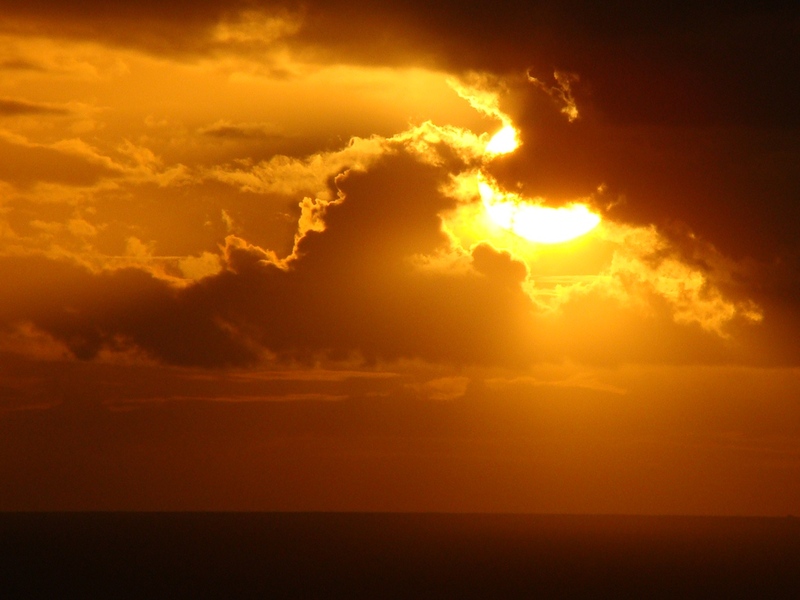 As the ocean crust was pushed deeper and deeper into the underlying mantle, it heated up, and assisted by the presence of water, melted into magmas that rose upwards through the crust. Some of the magma exploded and flowed out the surface forming andesitic volcanoes, but other magma chambers cooled slowly three or four miles down in the crust, forming crystalline igneous rocks like diorite, granodiorite, and granite. 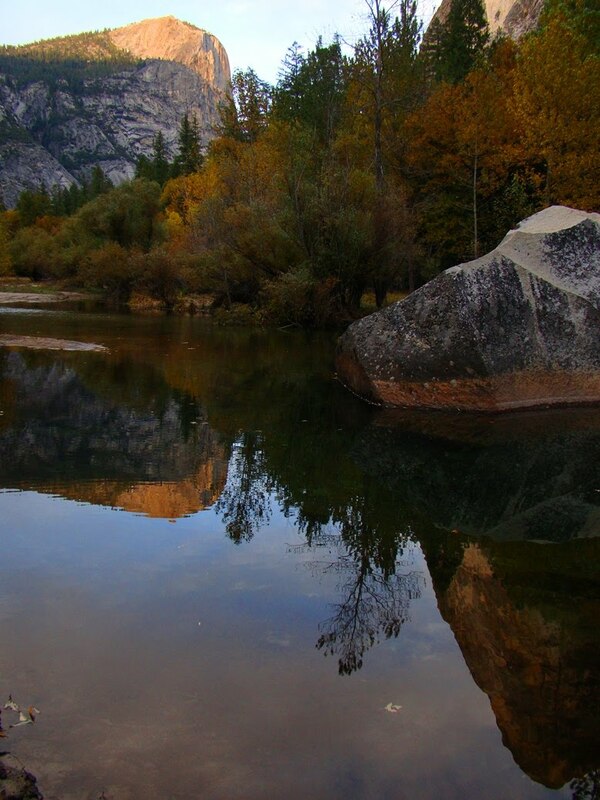 Those are the characteristic rocks of the Sierra Nevada batholith, exposed in places like Yosemite Valley, Tuolumne Meadows, and Sequoia/Kings Canyon National Park. 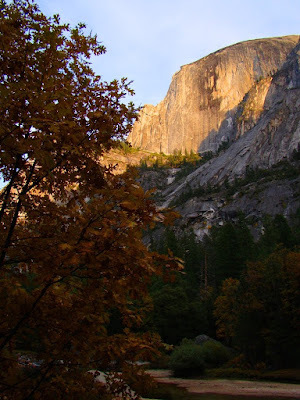 I've often stood on the edge of Yosemite Valley and looked at the vast exposures of granitic rock, and imagined the volcanoes that once stood above, miles higher. I even wrote an extensive web series about being under the volcano. In my mind I could stand on the flanks of the Mesozoic volcanoes, watching out for predatory dinosaurs and gazing at pterodactyls flying overhead. It took a lot of imagination, but today the feeling was a little more tangible. I was holding a piece of the volcano in my hand. I love where my geologic journeys lead; there are lots of pretty spectacular places to see in our present world, but so many more incredible landscapes of the past. It was a good day in the Coast Ranges! A Show of Fall Color...in California? California is known for many, many things: earthquakes, mudflows, budget deficits, urban crowding, beautiful mountains and coastlines, spectacular deserts, for instance. And Modesto, my homebase, is NOT known for much of anything except, well, George Lucas was born here, and...Gallo Wine is headquartered here. In fact, Modesto regularly shows up on the lists of the "worst 100 places to live". And invariably near the bottom of such lists. 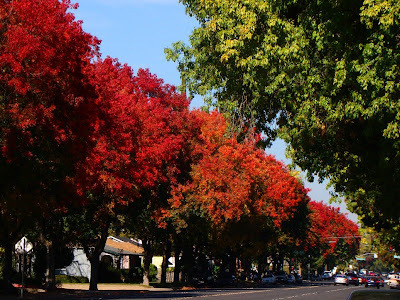 But we do have a special time of year, when Modesto is an exceedingly nice place to live: it's during those few weeks in late autumn when our trees turn. 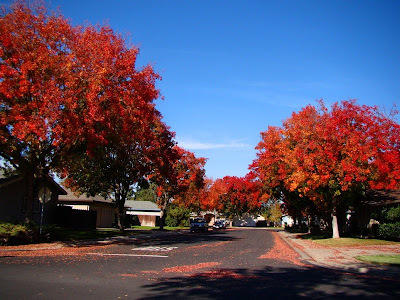 The city may be on a flat featureless 400 mile long plain (the Central Valley), and it may be dry and dusty in summer, foggy and cold in winter, but for these few days, the colors come alive. Some of the most colorful trees are the Modesto Ash Trees (Fraxinus velutina) that have been planted all over the core of the city. 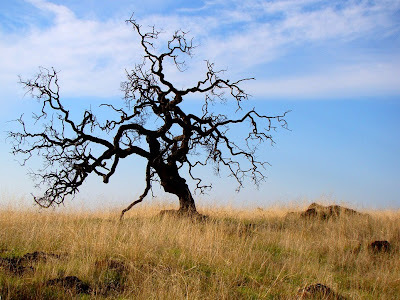 The trees are a good fit in many ways, being drought resistant, and capable of growing well in alkaline soils. 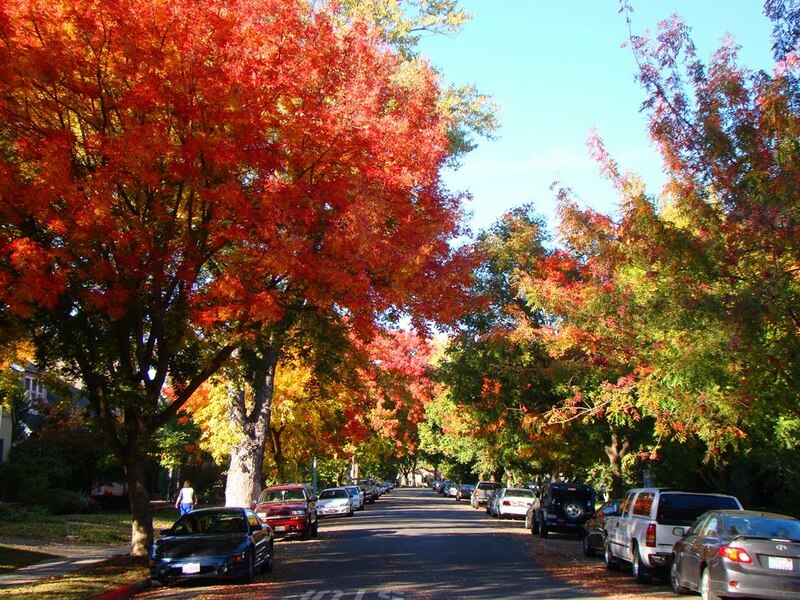 They grow fast and tall, although there are problems when their shallow roots encounter streets and sidewalks. For these couple of weeks, they are some of the most beautiful sights to see in our fair city. And despite what they say, Modesto isn't that bad! I had another marvelous day exploring the Sierra Nevada foothills, this time a Geology Club journey underground in a series of wild caves in the Stanislaus River Drainage. 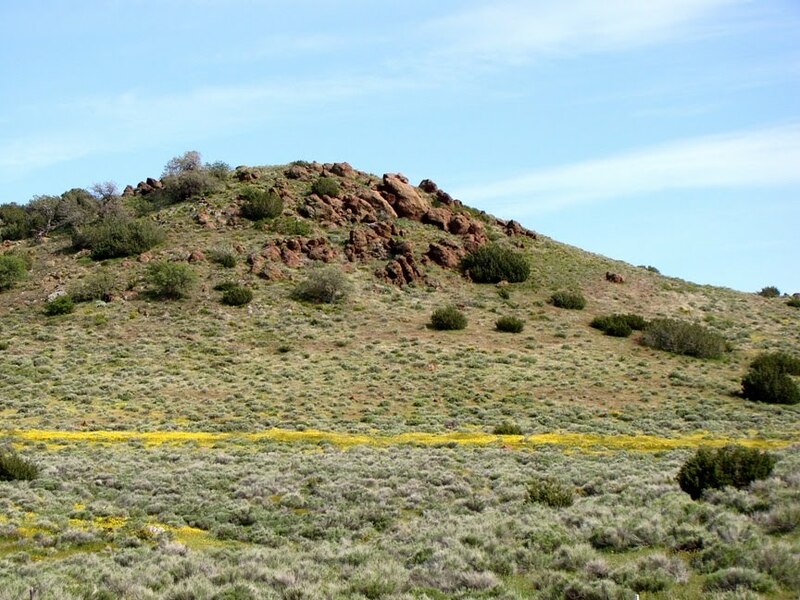 The host rock was marble of the Calaveras Complex, which originated as carbonate shelf and reef deposits in a late Paleozoic sea off to the west. The caves occurred high above the river and have not been active in a long time, being well above the regional water table. They would have formed when the adjacent canyon was more shallow, and the water table much higher. 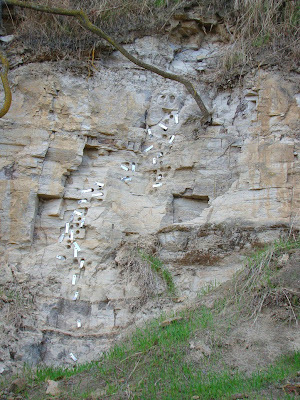 Minor formation growth can occur in the present day during the rainy season, but most of the formations show little evidence of activity. 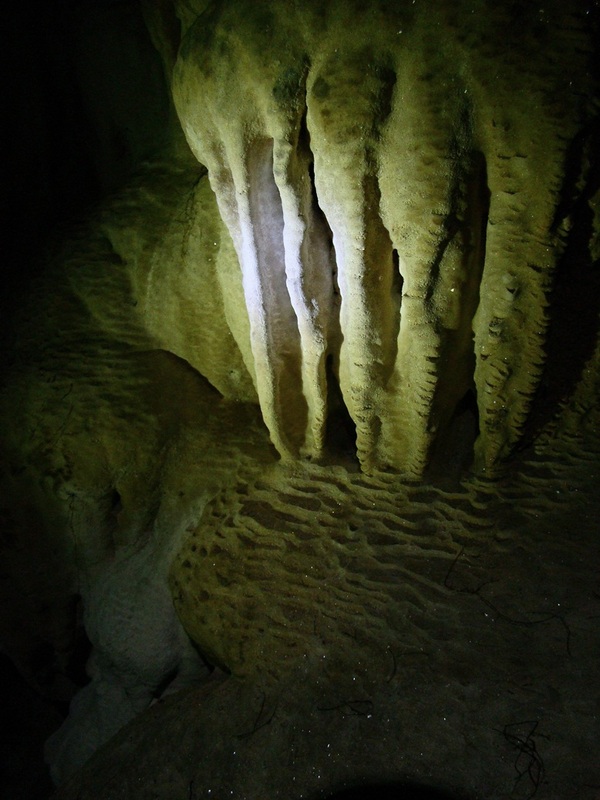 Wild caves are one of the precious geological gifts we have in our region, and one of the most fragile of environments. There are developed caves, which I have featured in previous posts, six or so, but around 1,000(!) 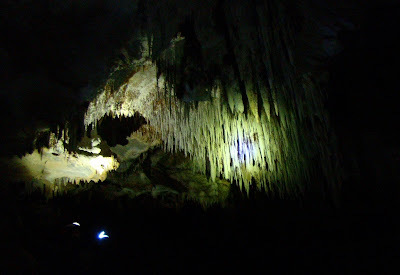 caves are known in the Sierra, including some that exceed 20 miles in total explored passages. Their locations are kept out of public attention because of the ease with which they can be vandalized (and vandalism is a huge problem). Our trip today was one of education and building an appreciation for these rare environments. 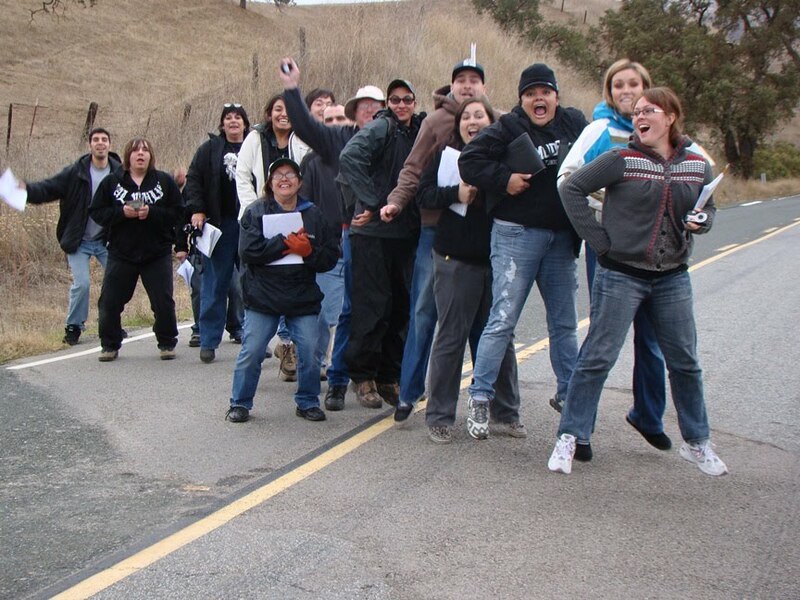 Our college students were accompanied by a group of local high school students who joined us in the exploration. We did an exploration of a small cave that required crawling and scooting through a narrow passageway to prepare them for the adventure of the larger cave a few hundred yards away. All of our explorers wore helmets and carried three lights for safety, but they also wore gloves to preserve surfaces in the caves. Any visit will impact a cave and the life within it (even clothing lint), so our purpose was to teach how to explore with the least amount of impact. They did well, as I saw no gratuitous touching of formations (although that may have had something to do with not one, but three "wrath of God" speeches before entering any of the caves). The largest cave we explored had a challenging squeeze through a very narrow passageway into a large room about 70 feet long (I tried not to think about the fact that it was the ONLY way out; what if someone got stuck? I have phobias...). 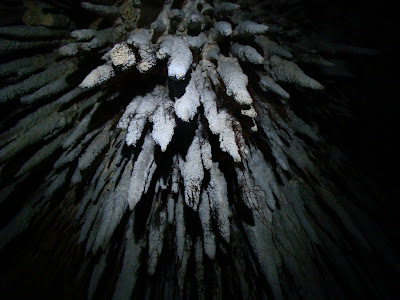 It is festooned with some glorious stalactites and columns that hang in thick masses from the high ceiling (click on both pictures above for a better view). In some sections, water flowing from cracks in the wall has formed flowstone and rimstone pools (above). 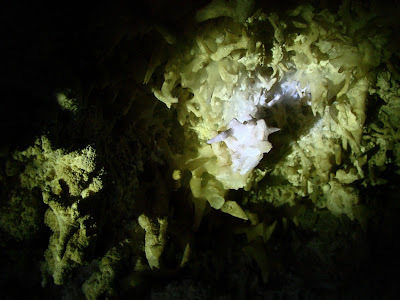 The cave formations (collectively they are called speleothems) are mostly composed of crystalline calcite (calcium carbonate), which is the reason the formation is sparkling. Although not quite so spectacular as those at Black Chasm Cave, there are helictites that have formed on the ceiling of the big room. Helictites are basically stalactites on LSD, paying no attention to gravity as they grow. Living organisms have a tough time of it in caves, with a general lack of food sources, but there is a surprisingly rich collection of creatures that live there, and which are adapted to life in total darkness. We saw quite a few spiders on this trip, but I was especially watching for salamanders, as I have seen them in this cave twice on previous trips. I didn't see any this time, but I've never had a good excuse to show a picture of one of them, so here it is. Anyone want to tell me the species? Update: Helena Heliotrope provides an example of the horrific damage that can occur in caves when morons and idiots find them. This sort of thing has ruined many caves in the Sierra, and elsewhere across the country. Cave vandalism is a serious problem, and the perpetrators deserve stiff fines and imprisonment. Hopefully education can overcome the tendencies people can have towards this sort of crime. Certainly a great deal of damage occurs through simple ignorance, too (not to mention injuries; I took a hard hit on the head this last weekend that made me see stars, and put a gash in my helmet). Thursday's Fun Foto was taken during my brief Veteran's Day exploration of the Sierra Nevada foothills along Merced Falls Road. The area near the road is a deeply eroded and weathered landscape of metamorphic slate and greenstone dating to Jurassic time. The soils support grass and the occasional oak tree, and is an excellent environment for the star of our fun foto, the California Tarantula. 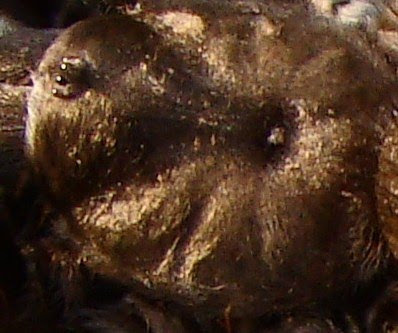 We must have some arachnophiles out there because the guesses zeroed in on spiders. 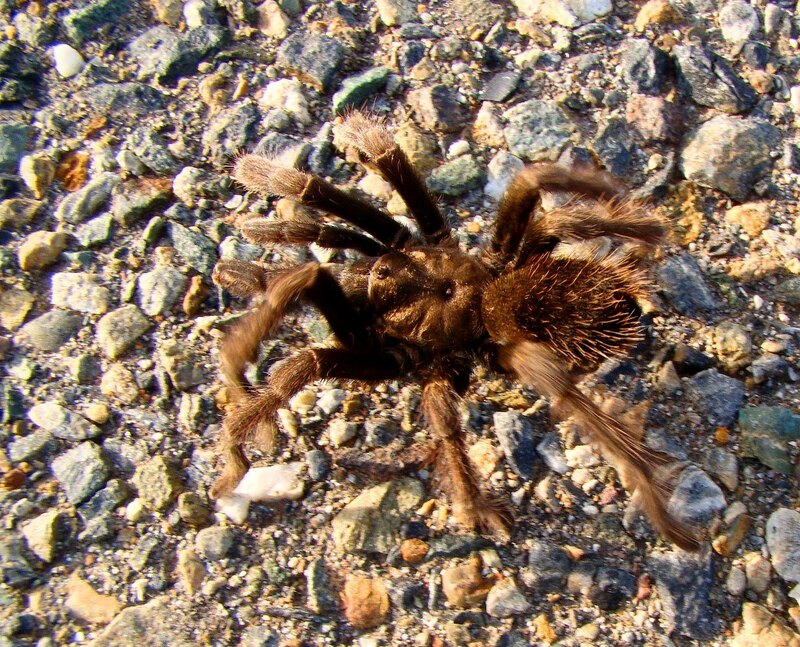 Our Sierra foothills are prime habitat for these huge arachnids. The females spend most of their time in burrows waiting to ambush their prey, which consists mostly of crickets. They can live as long as 20 years. The males have it a bit tougher...their hormones, or whatever, cause them to emerge in September and October to seek mates. They are exposed to plenty of danger at this time, including the tarantula wasp, which likes to inject venom into the poor spider, paralyzing it, and making it into a food source for the egg the wasp lays in it. If the male finds a willing mate, he also has to keep from becoming a meal for the female if times have been lean. All in all, the males are lucky to live more than a few years. As frightening and terrifying as they might appear, tarantulas rarely try to bite people, and even if they do, their venom is so weak that most people feel nothing worse than a bee sting. 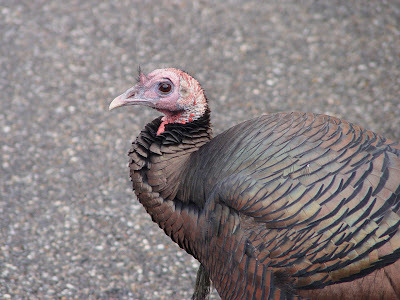 They are generally docile and would rather retreat from confrontation. They are also rather delicate; one source I ran across mentions that a fall of six inches can injure them while a fall of twice the distance can kill them. 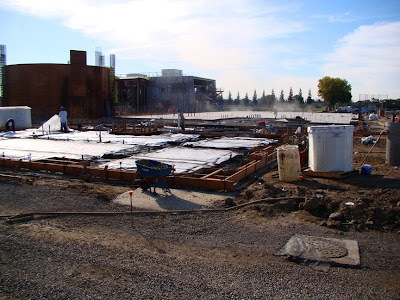 Community Science Center has a Concrete Foundation! For my local Modesto area readers, here is one of my promised (threatened?) updates on the progress of our Community Science Center at Modesto Junior College. The building will eventually house the chemistry, physics, astronomy and geology/earth sciences programs, but will also include a greatly expanded Great Valley Museum, a planetarium, and an observatory. The building has a foundation! It is actually a physical presence after 10+ years of planning. The structure on the left will eventually be the planetarium. When completed, the center will be a marvelous community resource, especially for our children. We are looking forward to occupying the building in 2012! One of the things I love about geology is the path it provides for traveling in a time machine. As a kid, I sooo wanted to walk around during dinosaur times to see what they really looked like (these were the days before "Jurassic Park"). Training in geology gave me the ability to do just that, in my mind anyway. It is such a powerful experience to uncover a dinosaur bone (or any fossil, for that matter), and visualize an animal's life and the land it lived on, however far removed the landscape today is removed from that time. Rocks tell the same story. Mention Yosemite or the Sierra Nevada, and one might visualize high granite peaks, deep glacier-cut valleys, and pristine alpine lakes. But in the Sierra foothills, the rocks tell a much different story, one that is far older. I took another afternoon drive looking for fall colors (still just getting started at the lower elevations), and found myself on the Tuolumne River near the old gold mining village of La Grange. There is a nice roadcut just north of the river exposing crossbedding river channel deposits from Eocene time revealing a very different landscape. The rocks are termed the Ione formation. 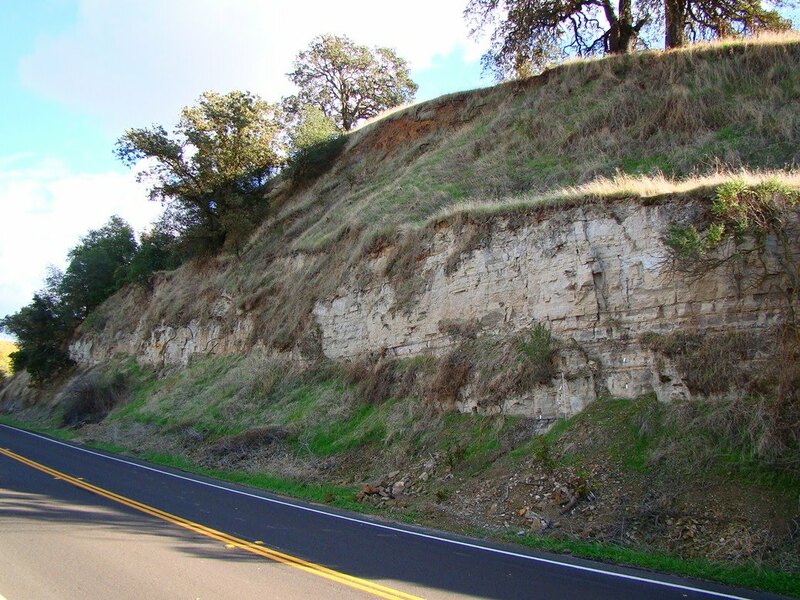 The gravels, sands and clays of the Ione were deposited in a distinctly different environment. The sand was deposited along a beach strand, the clays (and associated lignite deposits) in coastal estuaries and swamps, and the gravels in large rivers flowing into the coastal complex. Fossils in the Ione indicate tropical species. 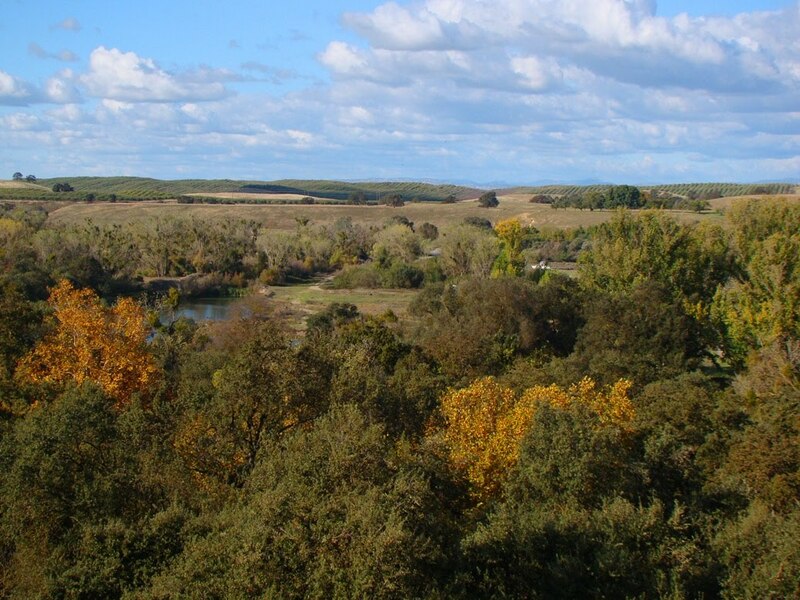 The Sierra of 40-50 million years ago was a coastal jungle, not unlike the coast of the Yucatan Peninsula of Mexico today! The mountains we call the Sierra Nevada were quite possibly not present at all beyond a few low hills. 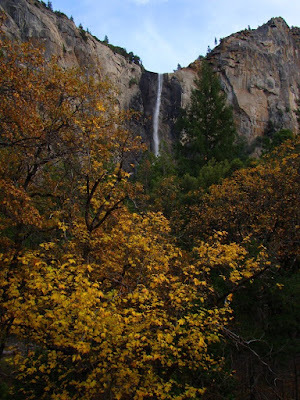 Many of the rivers, in fact, had their headwaters in central Nevada or further afield. On another stretch of the highway, there are roadcuts of white and tan deposits of volcanic ash. These belong to the Miocene Valley Springs formation, rhyolite ash deposits formed during violent caldera eruptions around 22-28 million years ago. Some of the ash deposits had their source near the present Sierra Crest, but some may have come from central or eastern Nevada. 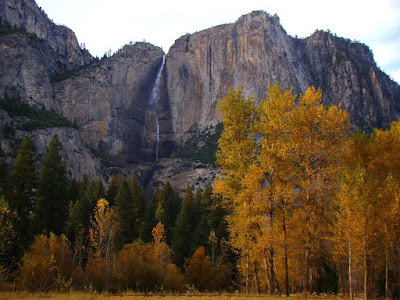 Again, the Sierra would not have resembled the mountains we see today, and instead might have resembled the Cascades, with active stratovolcanoes and cinder cones. Some aluminum tags caught my eye when I was snapping pictures of the Valley Springs outcrop. Someone is doing some detailed research here! Cores had been taken every couple of inches. I'd love to hear what you are up to, if you happen to be the one doing the work. Knowing that the rivers were flowing again from the recent storms, we headed towards Mirror Lake at the upper end of valley. Mirror Lake kind of begs the definition of a "lake". If formed as a result a massive rockfall off the north cliff near Washington Column. A much larger lake persisted for centuries, but it slowly filled in with sand and gravel over the years. 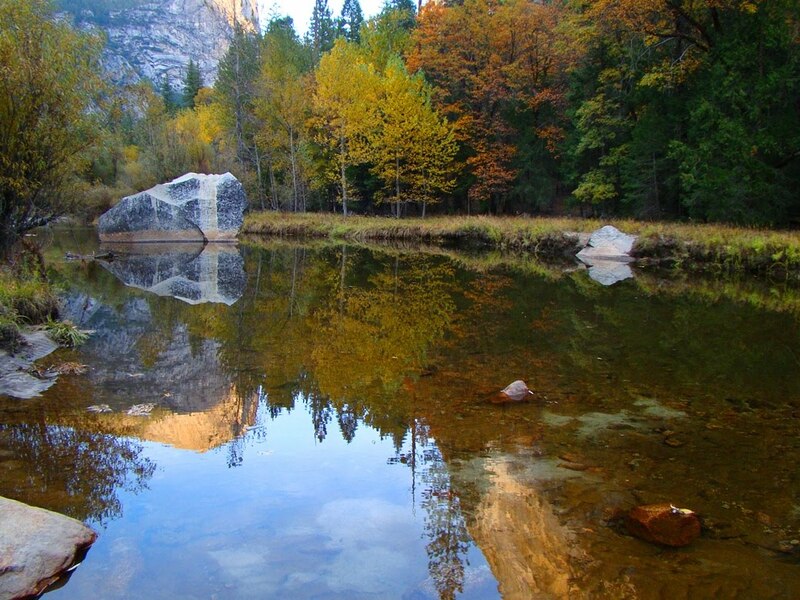 During spring runoff, Tenaya Creek ponds up, providing a reflective surface very popular with photographers. Half Dome looms high above Mirror Lake, so high that it is difficult to get the cliff and the reflection in a single picture. There was enough water in the creek Friday to catch reflections of the trees and Mt. Watkins, although the water was several feet below the level we've seen in springtime. Then, it was time for dinner at the Mountain Room, and a stop to watch the stars at Gateway View, and a two hour drive home and back to the reality of grading. It was a wonderful day. "There is No Reason For Optimism"